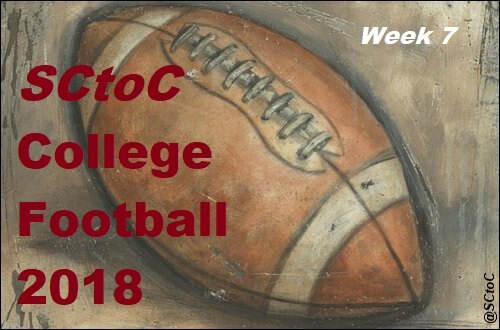 Welcome to SCtoC's week 7 coverage of the 2018 College Football Season. What: The Ducks face their out-of-state rival Huskies in Eugene. When: Saturday, October 13 at 12:30 p.m.
2018 Records: Huskies 5-1 (3-0 Pac-12 North; Ducks - 4-1 (1-1 Pac-12). Head Coaches (overall as HC): Huskies - Chris Peterson (133-30); Ducks - Mario Cristobal (29-49). 2017: The Huskies defeated the Ducks, 37-10, in Seattle. Huskies Notes: The Huskies staved off a late fourth quarter rally to keep Chip Kelly and UCLA winless on the season. Along with Stanford and this Oregon squad, the Huskies figure to be in contention for the Pac-12 North title and an invitation to the conference championship game. Jake Browning was solid, if not impressive, in the win over the Bruins. He completed 18 of 26 passes for 265 yards with a touchdown and a pick. He also rushed for 49 yards and a score. Myles Gaskin rushed for 116 yards and two scores, while Aaron Fuller caught five passes for 100 yards and a touchdown. Ducks Notes: The Ducks shook off their week 4 overtime loss to Stanford by downing Cal two weeks ago, 42-24. Coming off a bye week, they have an opportunity to pick up a win over the Huskies which would help them in the college rankings, and in the race for the Pac-12 title. Justin Herbert was 16 of 22 for 225 yards with a pair of touchdown passes. Travis Dye gained 115 yards on 20 carries with a touchdown, and C.J. Verdell added nine rushes for 106 yards. Dillon Mitchell, one of the premiere wide receivers in the Pac-12, had seven grabs for 105 yards and a score. What: The Vikings welcome the Bears of Northern Colorado to the Rose City. When: Saturday, October 13 at 2:05 p.m.
Where: Providence Park; Portland, Oregon. 2018 Records: Bears 0-4 (0-6 Big Sky); Vikings 2-4 (1-2 Big Sky). Head Coaches (overall as HC): Bears - Earnest Collins Jr. (32-71). Vikings - Bruce Barnum (13-26). 2017: These teams did not meet last season. Bears Notes: The Bears are looking for their first win of the season as they visit Portland to face the Vikings. They scored 26 fourth-quarter points in week 6, but still were unable to rally past UC Davis. The Bears fell, 49-36 in Greeley, Colorado. Conor Regan went 28 of 48 for 387 yards with two touchdown tosses and a pair of picks. Alex Wesley hauled in nine passes for 178 yards and a touchdown in the loss. Willie Fairman added 63 yards on four receptions. Milo Hall and Trae Riek each rushed for a touchdown. Vikings Notes: Freshman kicker Cody Williams' 52-yard field goal with four seconds remaining stunned Division I-AA football last week. The field goal lifted the Vikings to a 22-20 win over #16 Montana in Missoula. It's easily the Vikings' signature win over the past two seasons. Davis Alexander completed 15 of 28 passes for 170 yards in the win. Sirgeo Hoffman rushed for 80 yards off 20 caries with a touchdown, and caught five passes for 50 yards. Emmanuel Daigbe and A.J. Ruffin each tallied 70 receiving yards. This game is the only home game to be held at Providence Park this season. What: The Eagles soar into Ogden to face the Wildcats. When: Saturday, October 13 at 3:05 p.m.
Where: Stewart Stadium; Ogden, Utah. 2018 Records: Eagles 5-1 (4-0 Big Sky); Wildcats 3-2 (2-1 Big Sky). Head Coaches (overall as HC): Eagles - Aaron Best (12-5), Jay Hill (29-25). 2017: The Wildcats defeated the Eagles, 28-20, in Cheney, Washington. Eagles Notes: Barring their loss to Washington St. in week 3, the Eagles are truly soaring through their 2018 schedule. Even with quarterback Gage Gubrud sidelined, they dominated Southern Utah last week, 55-17. Step in Eric Barriere. The sophomore stepped in, completing 13 of 21 passes for 233 yards with a touchdown while rushing for 98 yards and two scores. Sam McPherson rushed four times for 85 yards and a touchdown, while Antione Custer, Jr. had 14 carries for 77 yards and a pair of scores. Nsimba Webster continued his hot receiving hand, coming down with six grabs for 114 yards and a touchdown. Wildcats Notes: The Wildcats are putting together a respectable season. They'll look to use the friendly confines of Stewart Stadium to snag a win over the Eagles and move up in the Big Sky standings. The Wildcats came up short in week 6 to Northern Arizona, falling 28-24. Jake Constatine went 10 of 23 for 89 yards with a touchdown and a pick in the loss. Joe Logan rushed seven times for 55 yards, while Brandon Porter and Chancellor recorded 65 and 63 receiving yards, respectively. One of the Wildcats most notable athletes is Damian Lillard, a three-time all-star guard with the Portland Trail Blazers. What: The winless Bruins head to the North Bay to battle the Golden Bears. When: Saturday, October 13 at 4 p.m.
2018 Records: Bruins 0-5 (0-2 Pac-12 South); Golden Bears 3-2 (0-2 Pac-12 North). Head Coaches (overall as HC): Bruins - Chip Kelly (46-12); Golden Bears - Justin Wilcox (8-9). 2017: The Bruins defeated the Bears, 30-27, in Los Angeles. Bruins Notes: Chip Kelly has had a rough re-introduction to college football after having coached four years in the NFL with the Philadelphia Eagles and San Francisco 49ers. The Bruins' are clearly building with Kelly's brand of high-tempo offense. Freshman Dorian Thompson-Robinson completed 27 of 38 passes for 272 yards with a pair of touchdowns and an interception in the Bruin's week 6 loss to Washington, 31-24. Joshua Kelly rushed 20 times for 125 yards and a touchdown. Caleb Wilson tallied eight catches for 102 yards and a touchdown, while Theo Howard had a game-high nine grabs for 60 yards with a score. Golden Bears Notes: The Golden Bears' goal this year is to reach a bowl game in Justin Wilcox's second season at the helm. The Bears breezed through their non-conference schedule, but have dropped their first two conference games. The most recent was to Arizona, 24-17, in Tucson. Brandon McIlwain got the start in the loss to Oregon, completing 74 percent of his passes, but tossed three interceptions against zero touchdowns. The dual threat quarterback rushed 20 times for 107 yards and two scores.Maurice Ways led all receivers in the game with eight grabs for 97 yards, while kanawai Noa had three receptions for 97 yards. What: The Broncos head south to face the Wolf Pack. When: Saturday, October 13 at 7:30 p.m.
Where: Chris Ault Field at Mackay Stadium; . 2018 Records: Broncos 3-2 (1-1 Mountain West - Mountain); Wolf Pack 3-3 (1-1 Mountain West - West). Head Coaches (overall as HC): Broncos - Bryan Harsin (52-18); Wolf Pack - Jay Norvell (6-12). 2017: The Broncos defeated the Wolf Pack, 41-14, in Boise. Broncos Notes: The Broncos suffered a setback last week in their hunt to resume their post as champions of the Mountain West Conference championship. They are battling with teams such as the Wolf Pack to earn a shot at the conference title game. Senior quarterback Brett Rypien had perhaps his most challenging game of his career, completing 21 of 41 passes for 170 yards with two interceptions. Alexander Mattison rushed 25 times for 66 yards and a pair of touchdowns. Four receivers caught at least three passes on the day, led by Sean Modster's 4 grabs for 44 yards. Wolf Pack Notes: The Wolf Pack ran into a brick wall at home last week to Fresno St. Their 21-3 loss did nothing to help their chances to earn a bid in the Mountain West Championship game. Still, a home win over the vulnerable Broncos could set them back on track. Cristian Solano started his first game for Nevada last week, and went 22 of 43 for 195 yards with three interceptions. He rushed 23 times for 71 yards. Kaleb Fossum led the Wildcats in receiving with 12 receptions for 97 yards, while McLane Mannix caught four balls for 55 yards. On an personal SCtoC note, Nevada is located in Reno, adjacent to Sparks, the hometown of our assistant head coach, Nevadanut . Cal trails UCLA at halftime, 13-0. That's two wins in a row for 5he Vikings. They're 3-4 this season after going 0-11 last year. Tough loss for Cal. I had thought this game was winnable. Boise St. and Nevada are tied at halftime, 17-17. Now they are tied 24-24 with 6:51 in the 3rd quarter. It's been a really good game. 31-27 with 6 seconds left Nevada ball at their own 25 yard line. What a great final drive by Boise State. Made sure Nevada got the ball back without timeouts and barely any time left. Good game and good night all. Brett Rypien is an unsung QB. That was an excellent drive and strategy.